Here at the Institute, we are busy creating new and improved apprenticeships with the help of employers. But are school pupils likely to hear about the changes afoot? Some think more can be done. In this multi-part series, we speak to a school boy, an apprentice, and an employer, all of whom are familiar with the work of the Institute. They reveal concerns about their own past experiences, and what they think needs to be done now for employers to effectively engage young people. Young Matt Hopton, 16, recently undertook a work experience placement here, at the Institute. Beforehand, Matt says he had little knowledge about the apprentice opportunities that were open to him. Matt is now calling for employers to link up more with schools. "Before I started my work experience at the Institute for Apprenticeships I knew hardly anything about apprenticeships. I wasn’t aware that they were different types of apprenticeships, and that they covered such a wide range. I had never even heard of ‘degree apprenticeships’. I had no idea that, for some subjects you could earn a wage, and get real hands on experience by having a job - whilst also achieving a degree. I suppose I’d always believed that anyone who wanted an academic career only really had the option of choosing the ‘traditional route’ - namely A levels, followed by a degree. I think I’d also assumed that many employers would only take on people who had followed this route. It hadn’t really occurred to me that the hands on experience and training available via an apprenticeship, was also something that many employers would consider of value. But after a few days working at the Institute for Apprenticeships, it became clear that the aim was for us to have apprenticeships that are a credible alternative route. Because the Institute’s focus is on the ‘quality’ of apprenticeships, regardless of where they happen to be located or who delivers them, it feels like a much fairer system is being created – with quality apprenticeships now accessible to everyone. 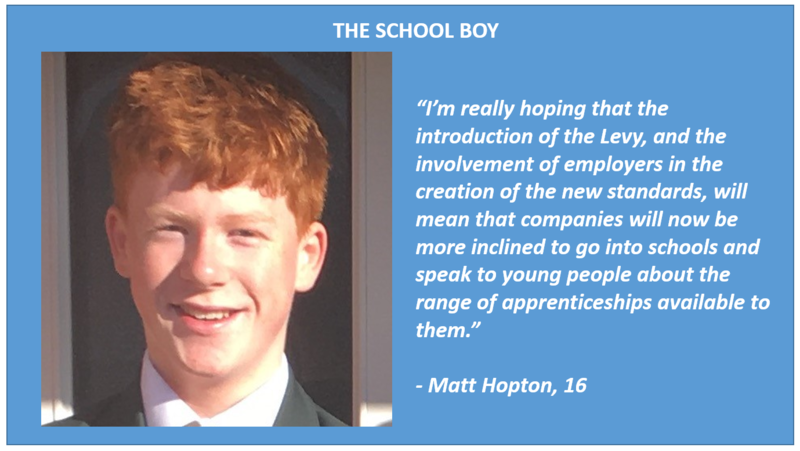 I’m really hoping that the introduction of the Levy, and the involvement of employers in the creation of the new apprenticeships, will now mean that companies will be more inclined to go into schools and speak to young people about the variety of apprenticeships available to them. Perhaps now the potential benefits of apprenticeships will begin to be communicated to us more. I think it’s so important for young people like me to hear more about apprenticeships, and the positive changes that are currently happening in this area. Francesca Beckett, 21, is nearing the end of her apprenticeship at IBM. Francesca says it was just a matter of luck that she found out about her apprenticeship. She thinks that employers might end up missing out on talent if they don’t keep forging relationships with schools and 6th form colleges. "I had very little knowledge as to what was available to me within the apprenticeship space when I was in my teens. I only found out about my own apprenticeship scheme because I spent a long time trawling the internet looking for opportunities. My sixth form college was very ‘university oriented’. I remember a questionnaire going out to pupils that asked us about our future plans. We were given three boxes to tick: ‘University’, ‘Job’, and ‘other’. But the main focus was on university applications. That was four years ago, and the range of apprenticeships may have been narrower then, but from my experience of talking to students, I’m not sure all schools and 6th form colleges have completely moved on with their thinking. Those that have, are offering employers more opportunities to speak to pupils and students about what is available. I think this is a really positive development, and hope that all the others follow suit. I’m not against university. I do feel this route is best for some career paths, and possibly a better choice for certain people for other reasons. But I was interested in a business related career and felt that the apprenticeship route would give me an edge over my university-bound peers. I didn’t see how ‘spending three years in a classroom’ would put me ahead of the game when it came to finding a job. At the end of the day, all of these students would be leaving university at the same time, with the same qualification, often with no work placement experience at all. Suffice it to say, my apprenticeship experience at IBM has completely lived up to my expectations. My apprenticeship scheme happened to guarantee a job at the end of it, which of course was a big positive. I now have a sense of job security, and truck loads of vocational experience on top of my studies in the area. From day one, my firm focused on pushing my career forward and developing my skills. So you can see why I wouldn’t currently feel at any disadvantage to a graduate of my age and stage who may be aiming to enter my field now. I also have the added advantage of being in a strong financial position with the ability to buy a property and a car - unlike my peers who are now leaving university. It’s great to hear that the Institute is focusing on improving the quality of apprenticeships, and it feels as though the apprenticeship opportunities for school leavers will soon be better than ever before.